You are here: Home » RESOURCES » Coaching 101 Minute » What Does Trust Have To Do With Coaching? Real learning can only occur in an environment of trust. Without trust, a human being’s unique capacity for learning and developing simply shuts down. 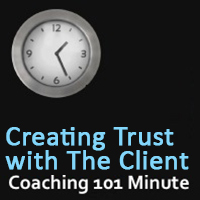 Within a trusting space, strong emotional connections can be made between yourself and your client, your work colleague or your partner in life. These connections enable powerful growth to occur. If trust is not established, then this type of emotional connection can’t happen, and without this type of emotional connection, you are probably not really succeeding in the area of personal growth at all. So often today we see relationships that are troubled by conflict, disagreements and negativity. To be able to create trust we first must want to commit to taking responsibility for creating a trusting space and a positive outcome. If we don’t come from this place of commitment then it won’t happen. Let’s consider the many relationships that we operate within. There are work relationships, personal relationships, family relationships, etc. Work relationships can be with fellow workers or your clients. Whether you are a consultant, employee, friend, or family member, you will have many relationships. For the purpose of creating a trusting space lets refer to each of these people in your life as your partner. What is a Trusting Space? In a trusting space, your partner is seen at their best even when they can’t see this themselves. In a trusting space, your partner is free to talk about their values, their dreams, their hopes and their aspirations in the complete confidence that these will be met with full acceptance. In a trusting space, you are able to trust in your partner, knowing that they bring a strong set of skills to the relationship. In a trusting space, your partner is able to trust that you will act ethically and in their best interests at all times. Imagine a world where this happened all the time. 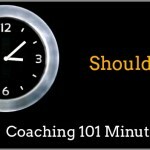 How do I know when I am ready to take on clients as a coach? What sort of feedback will I receive as a student? Will I be learn through real coaching sessions, or will they be a role play?